Nessun uomo è insensibile al fascino di un bel racconto. E spesso i bei racconti si intrecciano col Mito, in un labirinto di ricordi, emozioni e suggestioni. 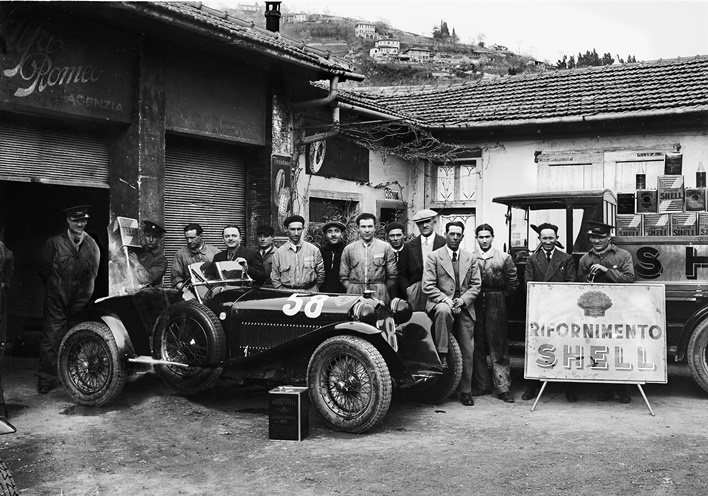 Parte da qui il desiderio di raccontare l’Italia attraverso le gesta leggendarie dei protagonisti di 1000 Miglia e degli uomini che hanno segnato quell’epoca storica. Come Tazio Nuvolari, pilota dotato di tecnica insuperabile e di infinito coraggio, grazie ai quali portò ripetutamente alla vittoria i bolidi affidatigli con cura paterna proprio da Enzo Ferrari. Ed anche come Gabriele D’Annunzio, la cui biografia artistica e personale assume costantemente i colori del Mito. Nasce così “ l’Italia del Mito “ , che assume 1000 Miglia come testimone di un messaggio universale: “la corsa più bella del mondo nel Paese più bello del mondo”. Un inno all’Italia, generosa nel dispensare la bellezza dei suoi luoghi e dei suoi tesori artistici. Un inno a Sirmione, che raccoglie ed onora questo impegno con entusiasmo e passione. every day 10:30-12:30 a.m. 4:30-7:00 p.m.
Friday and Saturday open until 10:00 p.m.
No one can resist the charm of a great story. And often beautiful stories are laced with Heroes, in a maze of memories, emotions and awe. 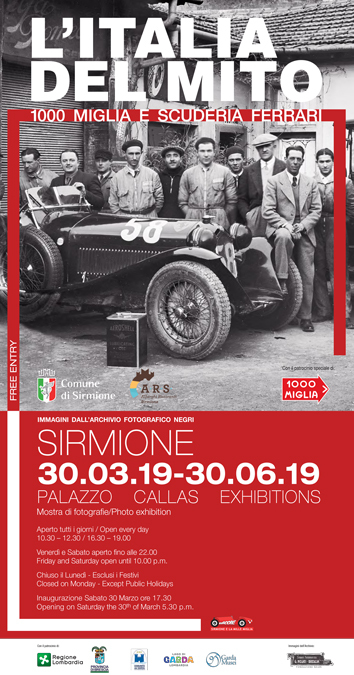 This is why we want to tell you the story of Italy through the legendary feats of the Mille Miglia heroes and the men who left their mark on this period of history. A story consisting of words and, above all, unpublished pictures from the Negri Foundation, a “treasure trove” that is almost certainly one of a kind. The story of extraordinary men like Enzo Ferrari, who just 90 years ago conceived the legend of the “Prancing Horse”, creating Scuderia Ferrari. Like Tazio Nuvolari, a driver with unsurpassed skill and infinite bravery, who repeatedly brought home victories in the racing cars that Enzo Ferrari entrusted him with paternal care. Not forgetting Gabriele D’Annunzio, whose artistic and personal memoir, is constantly tinged with the colours of Legends. The legend is therefore a way of expressing and, more importantly, a way of thinking. Our way of projecting images of symbolic value everywhere, inside and outside of ourselves. So “The Italy of Legends” was conceived, using the 1000 Miglia as witness to the universal message: “the most beautiful race in the world in the most beautiful country in the world”. An anthem to Italy, a country so generous in its supply of beautiful places and artistic treasures. An anthem to Sirmione, a town that embraces and honours this commitment with enthusiasm and passion.